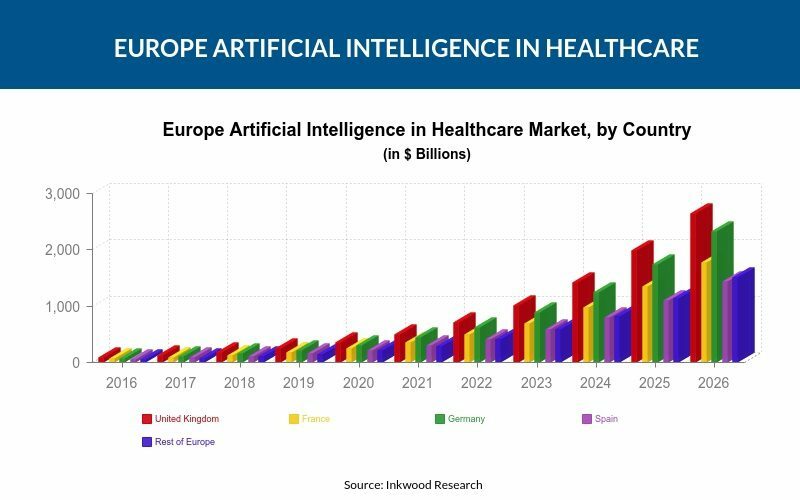 Europe artificial intelligence in healthcare market accounted for the second highest revenue share in the global market. For the estimated period of 2018-2026, the market is forecasted to grow at a CAGR of 39.27%. United Kingdom, Germany, Spain, France, and Rest of Europe are the geographies analyzed for this market. At present, the UK market accounts for the highest revenue share. Europe artificial intelligence in healthcare market accounted for the second highest revenue share in the global market. For the estimated period of 2018-2026, the market is forecasted to grow at a CAGR of 39.27%. United Kingdom, Germany, Spain, France, and Rest of Europe are the geographies analyzed for this market. At present, the UK market accounts for the highest revenue share. However, the German artificial intelligence in healthcare market is predicted to showcase the highest CAGR by the end of the projected years. The use of AI in innovative surgeries and its integration with existing systems are touted to provide this market with added advantages. In terms of applications, Natural Language Processing is presently commanding the market. The difficulties in maintaining the data security and the ambiguous regulatory guidelines in the region are some of the challenges that have emerged over the years. Deep Genomics Inc, Google Inc, Oncore Medical Inc, International Business Machines (IBM) Corporation, Recursion Pharmaceuticals Inc, Intel Corporation, Welltok Inc, Next It Corporation, Microsoft Corporation, Icarbonx, Ge Healthcare, Deep Genomics Inc, Enlitic Inc, General Vision Inc, Nvidia Corporation, and Stryker Corporation are the leading players in this market.